It won't wow you with speeds or its price tag, but it does offer an important privacy promise. PrivateVPN is a name we’ve heard before, but this new service from Trunkspace Hosting is not to be confused with Sweden-based PrivateVPN.com. 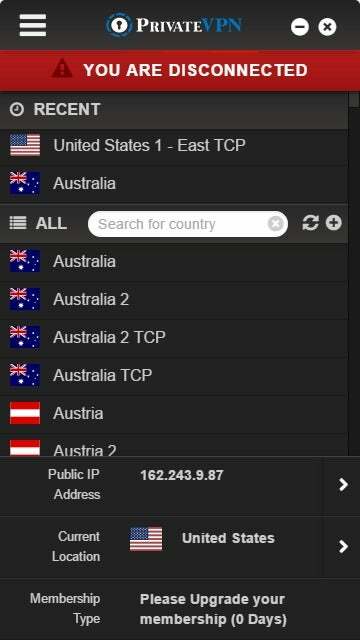 Trunkspace’s PrivateVPN is a very basic affair that allows you to get online with servers in 48 countries. The Trunkspace VPN on Windows offers a single-pane interface listing all of the supported country connections. You typically have at least two choices per country. 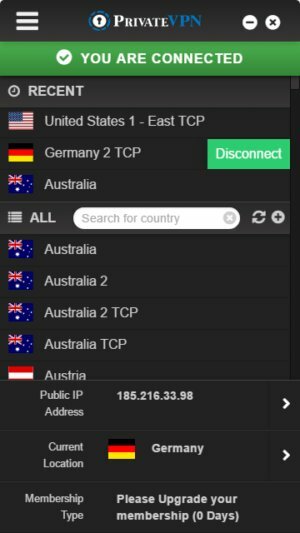 To connect to a specific server, you select it and click the Connect/Disconnect button to the right of the country name. Trunkspace Hosting’s PrivateVPN without an active connection. A bar at the top of the window turns red when you aren’t connected, yellow when it is establishing a connection, and green when the connection is active. Under Settings, which is accessed via the “hamburger” menu icon in the upper-left corner, there are a few added options. The Stealth VPN checkbox helps obfuscate traffic in order to bypass network firewalls blocking VPN connections. Under Advanced Config on the settings page there’s an option to Disable Internet on disconnect, which stops all internet access when your VPN connection drops. Finally, under Routing you can specify that only certain domains will go through the VPN. This is useful if you only want to protect a connection to corporate email, for example, while keeping your casual browsing outside of the VPN. The routing feature isn’t particularly difficult to use but is more of a power user feature. What’s odd about this application is that Trunkspace chose not to have it sitting in the taskbar. Instead, to reveal it you have to open the system tray, and then click on the icon there to bring the application to the foreground. I asked Trunkspace CEO Atif Khan about the taskbar-less approach, and he said many Trunkspace customers prefer it this way. PrivateVPN with an active connection. Trunkspace’s performance was alright in some instances, but overall it wasn’t as high as we’ve seen with other services. Based on our testing, Trunkspace PrivateVPN was able to maintain an average of 19.26 percent of the base speed. That’s really low considering that the top performers we’ve tested reach as high as 50 percent, and middle-of-the-pack performance is around 30 percent. That’s not to say some of Trunkspace’s speeds weren’t fast. In fact, most scores were in the double digits but just not high enough to earn a better result. As usual, however, your experience may vary depending on your ISP, router, and devices. Trunkspace is officially based in Montreal. Its business address is a UPS Store in the city, but that’s not unheard of for a small company with employees that work remotely. Trunkspace’s CEO is, as mentioned earlier, Atif Khan, and the CTO is Jessica Chan. To sign up for Trunkspace PrivateVPN you need to supply the company with more information than many other services require, including your name, email, street address, and phone number regardless of your payment method. Trunkspace accepts payments via PayPal, credit card, bank transfer, gift cards, and a variety of crypto currencies. Trunkspace is a no-nonsense VPN. It doesn’t have any extra features that some VPNs offer, and its speeds are serviceable but not outstanding. It’s also a little too highly priced for what it’s offering in my opinion. You can find cheaper options out there with similar privacy policies that require less of your personal information. Trunkspace PrivateVPN is off to a good start with its privacy policies. If it dropped the price, and required less personal information it would come more highly recommended.